It is my Friday today, I am looking forward to the long weekend. The sun will be shining and I finally feel 100%, well almost I tried to take out the bathtub with my food last weekend and did a good number on one of my toes but I was finally able to squish the little purple appendage into a shoe yesterday ;). This is the last card I made while visiting with my sister a couple of weeks ago, it seem like so long ago now. It is a simple layout, I added some thin twine, a sentiment and some gems. 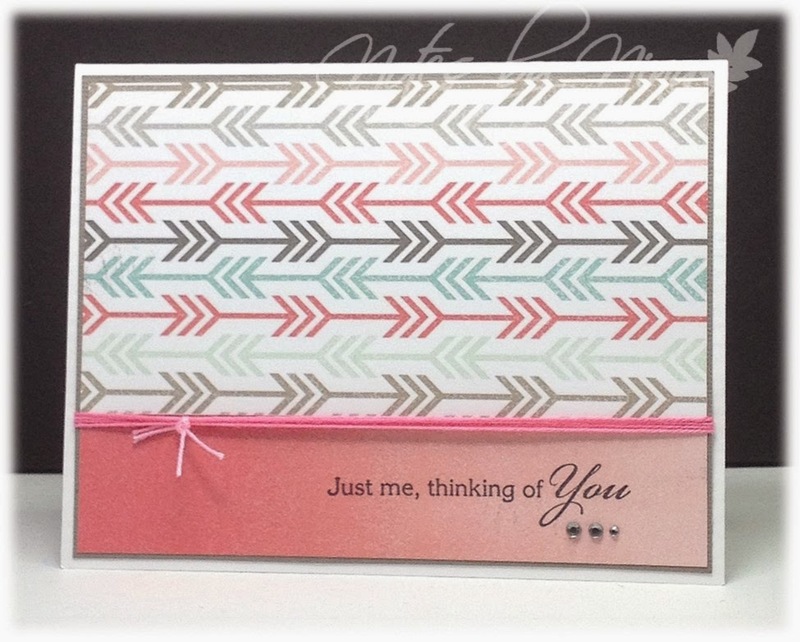 Supplies: White cardstock, Designer Paper – My Mind’s Eye, TPC – Just Me, twine and gems. Good Morning and Happy Tuesday, I have a quick post this morning to play along with the current Tuesday Morning Sketches. I printed off a digital image from The Next Stamp and used my watercolour pencils to colour it. I used lots of layers and was quite liberal with the layout, how could I not with these fun papers. I used a sentiment for the three dots and added some cute clouds around Tobi. I finished with a clear tinted sequin in the center of the pinwheel. Supplies: White card stock, Designer Paper-Pebbles, Your Next Stamp-Tobi with Pinwheel, Hot off the Press - Tiny words, Memory Box die cuts, twine, sequin. Surprise!! No Christmas cards today instead we are celebrating Leanne's birthday so this is a surprise hop. I used a simple layout for my card, I pulled out some pretty blue printed paper that looks almost vintage to me. I added some small butterfly's with little gems for the bodies then finished with the sentiment. 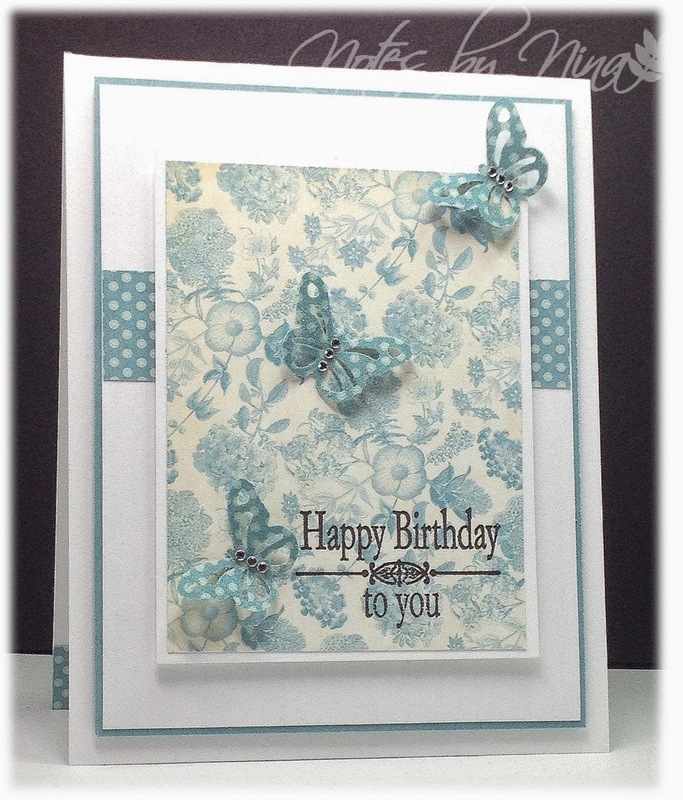 Supplies: White and blue cardstock, Designer Paper - Graphic 45, Inspired by Stamping - Small Fancy Labels, gems, butterfly punch. 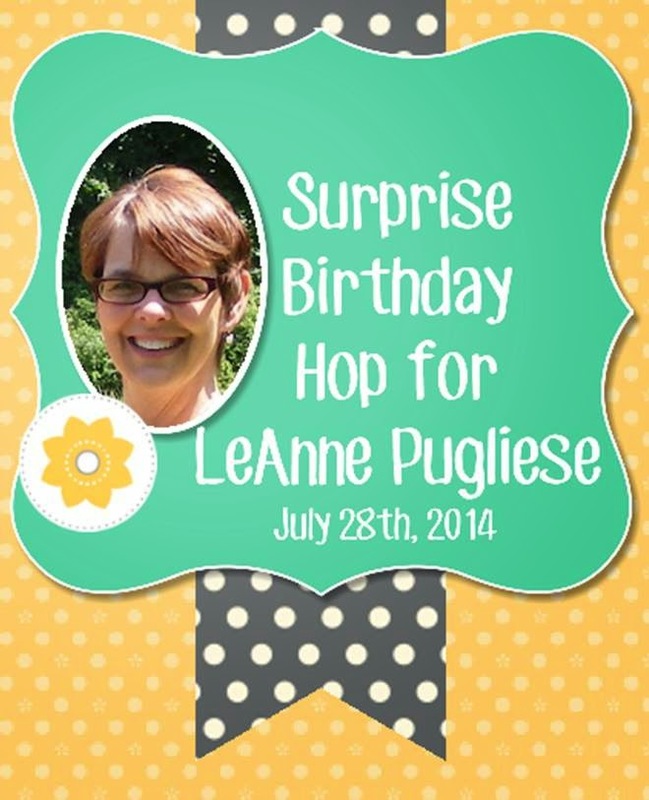 And don't forget the Birthday Girl, stop by her blog to give a little birthday cheer Leanne Pugliese. A quick card this morning, I am feeling under the weather so I have not made anything new the past couple of days. This is another card created when I was on holidays. I think these sock monkeys are adorable, I created simple layers and added the sentiment which is popped up with foam tape. I finished with twine and a button. 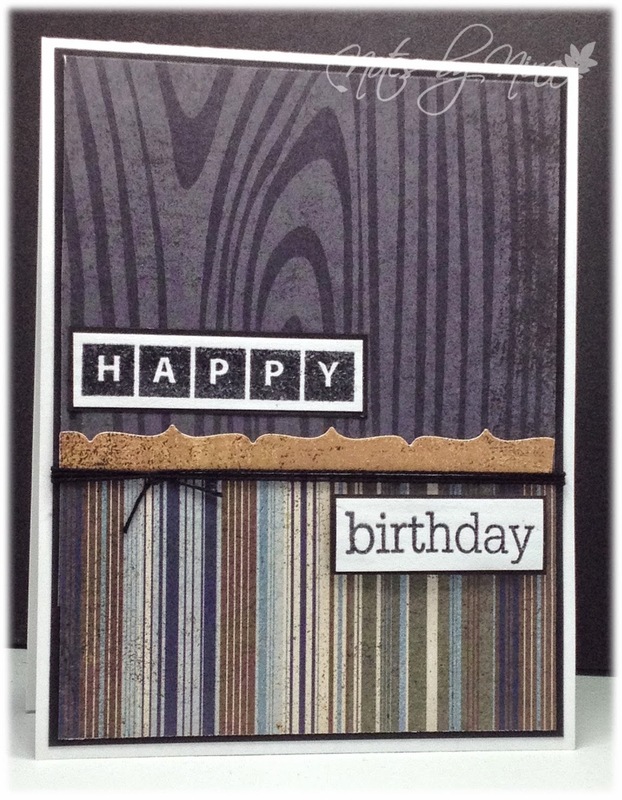 Supplies: White and black card stock, Designer Paper – Basic Grey, Paper Smooches – Birthday Sampler, button, twine. It is raining out..lots, and a little chilly too which would be perfect for crafting if I did not need to work. Have to earn the money to pay for all my fabulous craft supplies though :). I made this card while visiting with my sister last week, I found these pretty papers in her stash. She cut this cute little butterfly out with her Silhouette for me, the DP really showed its white core so I decided to use a little bit of Goosebump and sprinkle white glitter on top for the background to see what the effect would be and to pull the white from the paper in. It did not quite work out as I expected and the while glitter did not really sparkle but with the darker tone of the DP I almost think it looks better without sparkle. I did add some gems for the body of the butterfly. Good Morning and happy mid-week J. I had a chance to create in my craft room last evening so I played along with the current Tuesday Morning Sketches. This very cool image is from Graphic Fairy, my sister had it on her desk and gifted it to me so I could not wait to make a card with it. I turned the sketch and used lots of layers, the center panel is popped up with foam tape and I finished with some enamel dots. 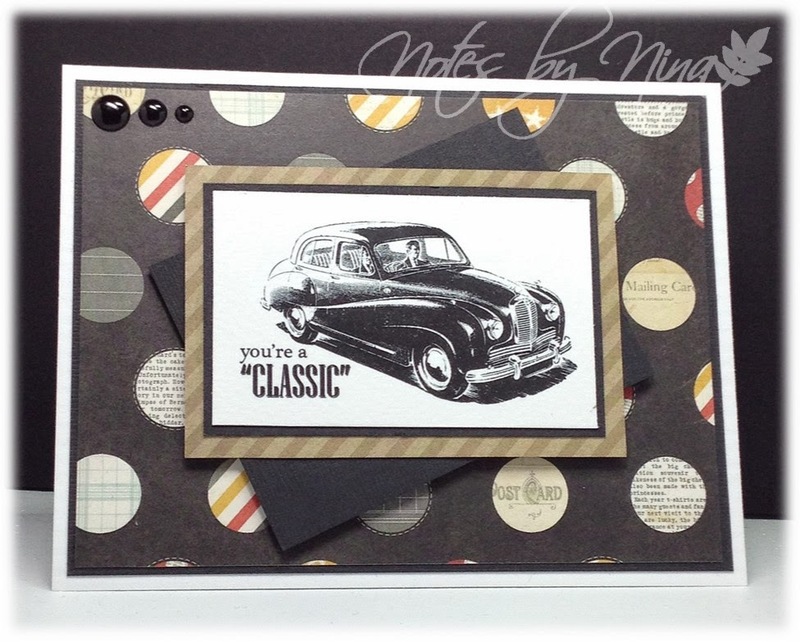 Supplies: White and black cardstock, Designer Paper – Simple Stories, Car image – Graphics Fairy, enamel dots. Should, woulda, coulda.. but alas I was asleep at the craft table. 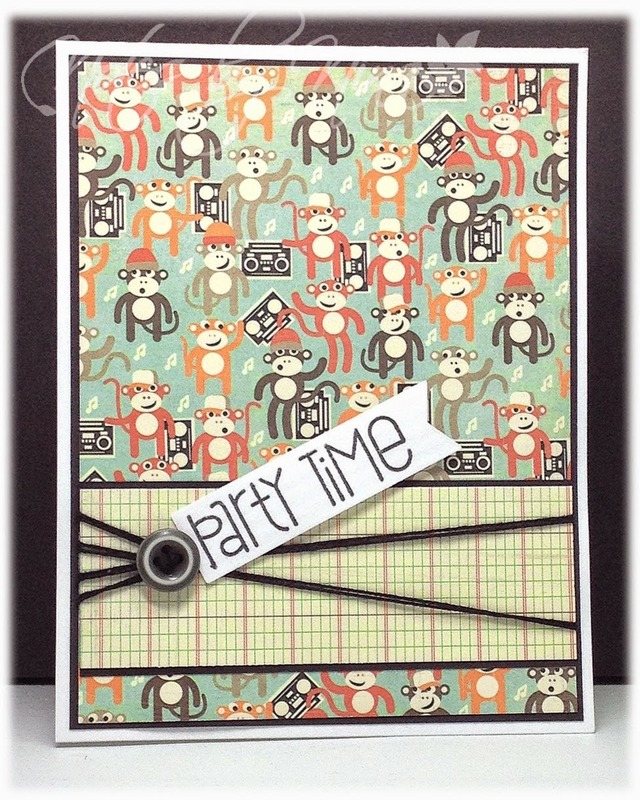 I made this card while on vacation for #10 of The Challenge over at Always Playing with Paper.. Alas I missed the deadline but I am still going to post it. 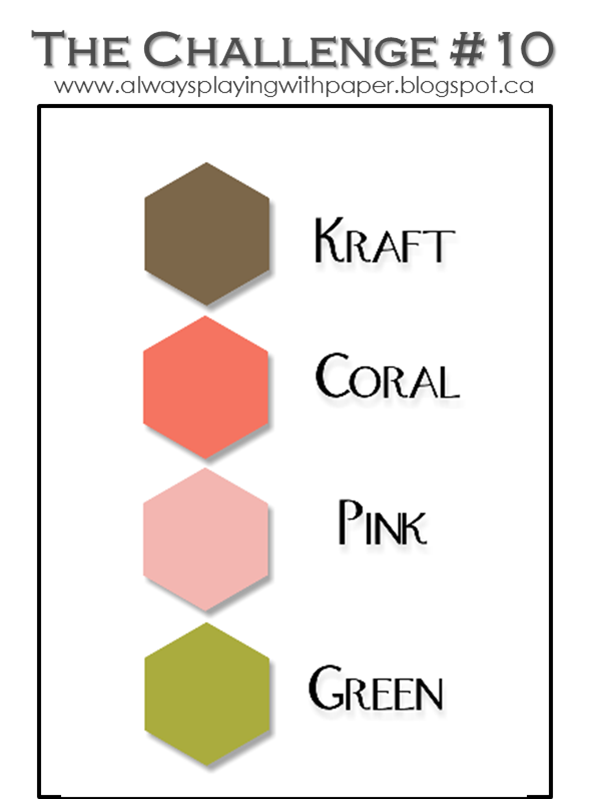 I used some borrowed designer paper – thanks sis, and I even think I managed all the colours although my coral looks a little closer to hot pink. I stamped the sentiment right on the DP, added a popped up element made with a die cut, a little bonus twine and a solo epoxy dot and it was done. 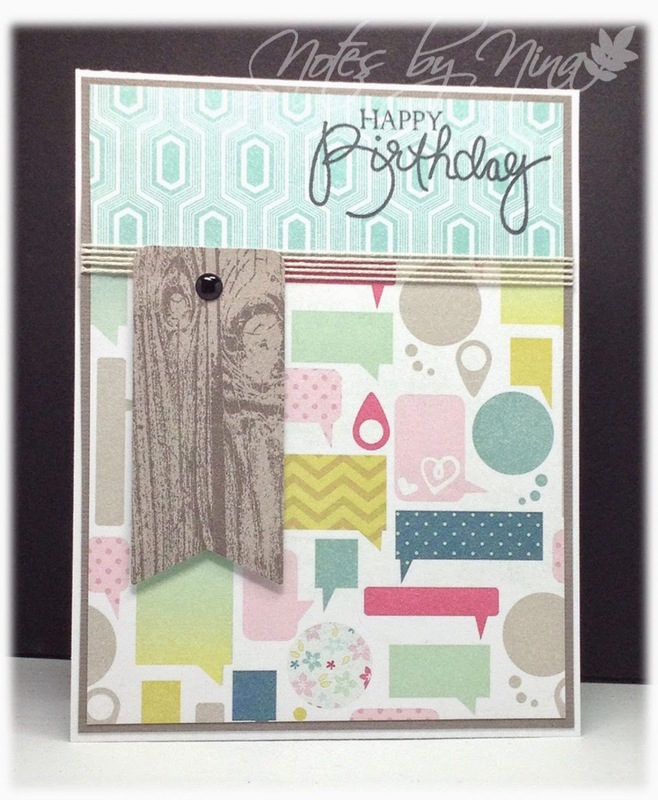 Supplies: White and gray card stock, Designer Paper – My Mind’s Eye, Papertrey Ink – Birthday Bash, Lawn Fawn die cut twine. 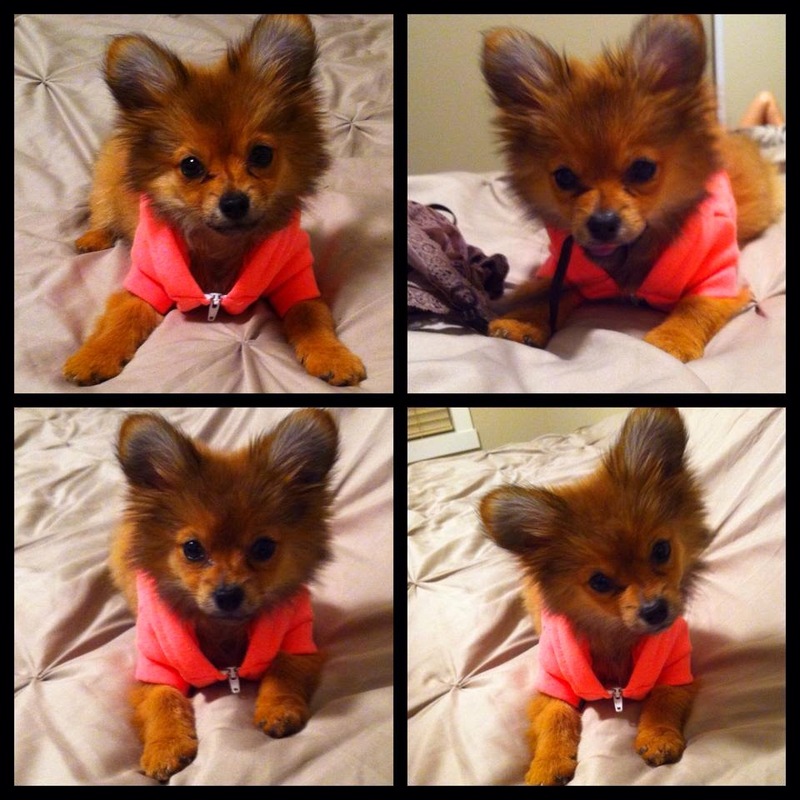 When I was on vacation I had the chance to visit my niece and her cute little sidekick. I could not resist making a tiny card for a tiny treasure named Fancy. The card is about 2.5 inches square and was such fun to make. 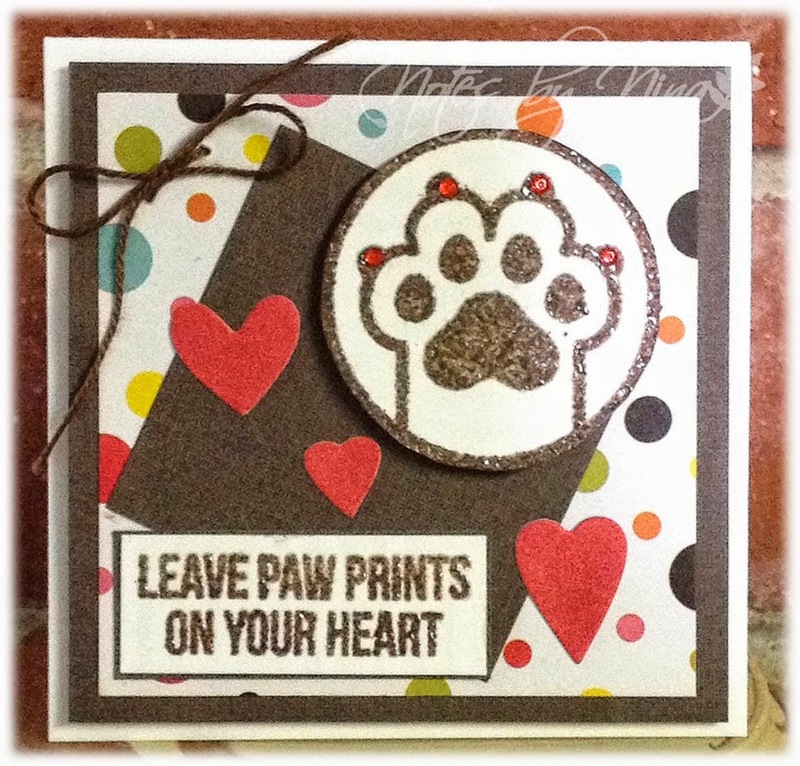 I heat embossed the paw and sentiment, I popped up the main panel and the paw print. I added some twine, die cut hearts and some girly red gems to the nails on the paw. Supplies: White and brown cardstock, Designer Paper -Ki , Sweet Stamp Shop - High Five, Memory Box die cuts, twine, gems. 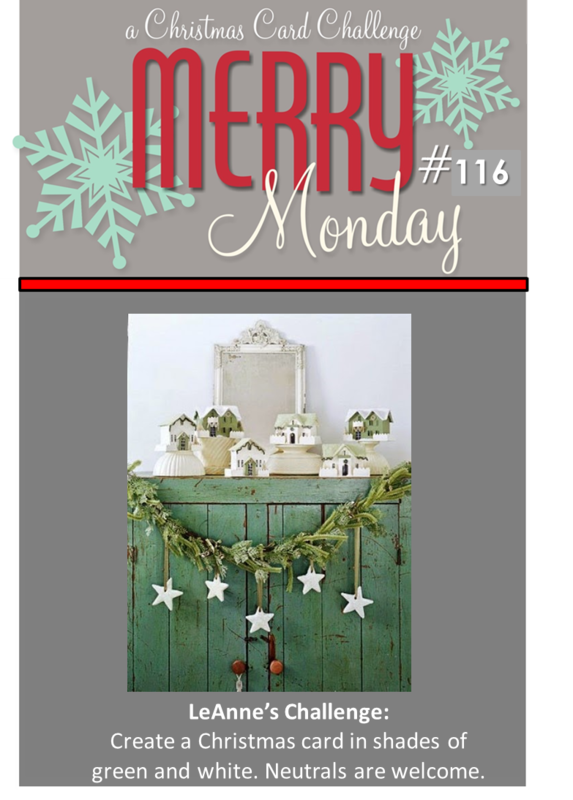 Good Morning and welcome to a new Merry Monday Card Challenge. 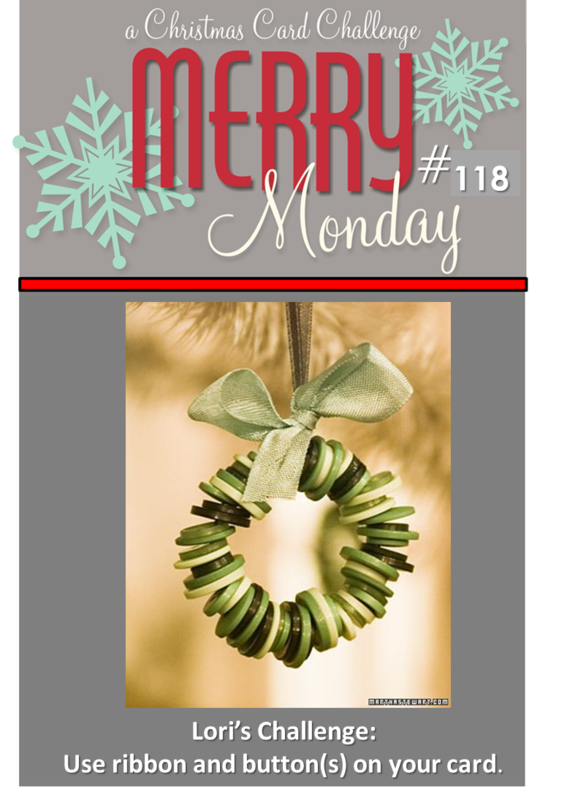 This week Lori is challenging us to use ribbon and buttons on our Christmas card. I started with a printable stocking and fussy cut the main portion of the out from DP and added a little texture, I used some flower soft to give the top, toe and heal a soft fuzzy look and I also popped them up with foam tape. I tried to create the background layers in the form of a mantle and I used an embossing folder to add brick texture to the top portion. I added three wood grain buttons to match the stocking and used a little piece of cream ribbon with gold trim to hang the stocking. I finished with a small sentiment. Supplies: Cream and brown card stock, Designer Paper – Fancy Pants, Verve – Holiday Phrases, clipart, ribbon, button, flower soft and embossing folders. Hello blogland – I am on the last day of my vacation today L. I have had lots of sun, fun and visiting, I am happy to be home but I am not looking forward to heading back to work tomorrow. I did not really take the time to stay connected so I have a few cards that I made with my sister that I will post over the next few days. The girls did a little road trip to the big city of Kelowna for a little shopping and visiting. We love to stop in a Memories and More and Ever After for some craft supplies, we did not get much of a chance to play with our new toys when we came back so I am looking forward to spending some time in my craft room this week. I did take some supplies that I dug out of that place DP goes to be forgotten and we had some great fun crafting throughout the week. 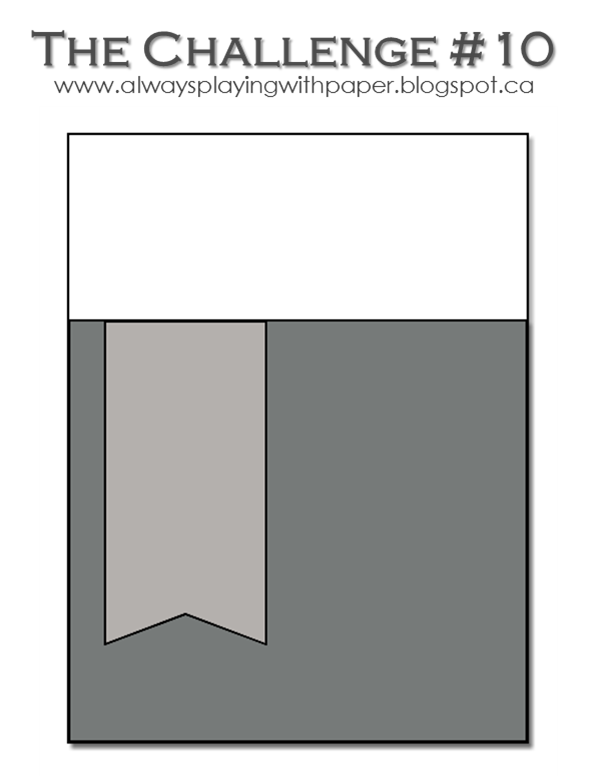 Supplies: White and black cardstock, Designer Paper - Basic Grey, Papertrey Ink - Birthday Bash, twine. I have more than a few sequins in my stash, I will be the one still using them long after they cease to be popular. I used a simple layout and added texture to the top portion with my snowy embossing folder and used a scrap of festive holiday paper on the bottom. I added some fine twine, then popped up sentiment and added sequins. 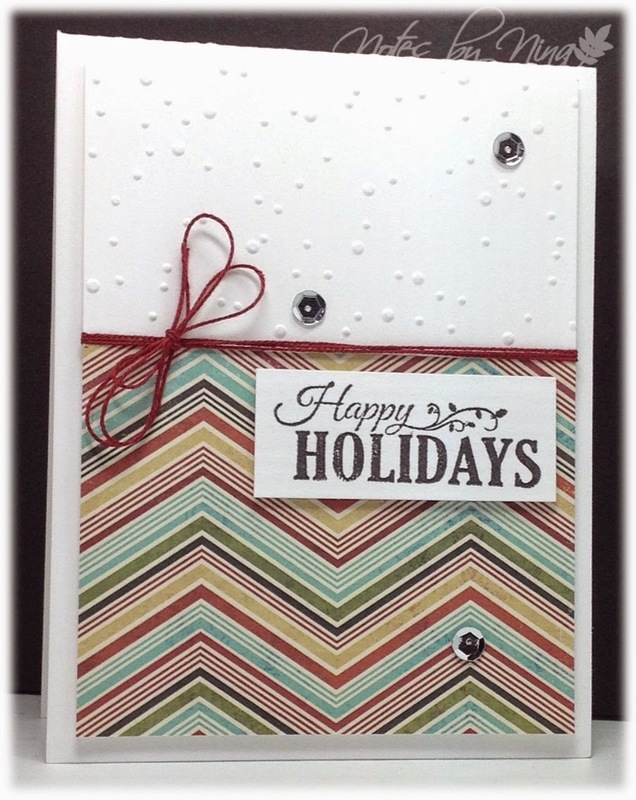 Supplies: White cardstock, Designer Paper - My Mind's Eye, Moments - Happy Holiday, twine, embossing folder, sequins. 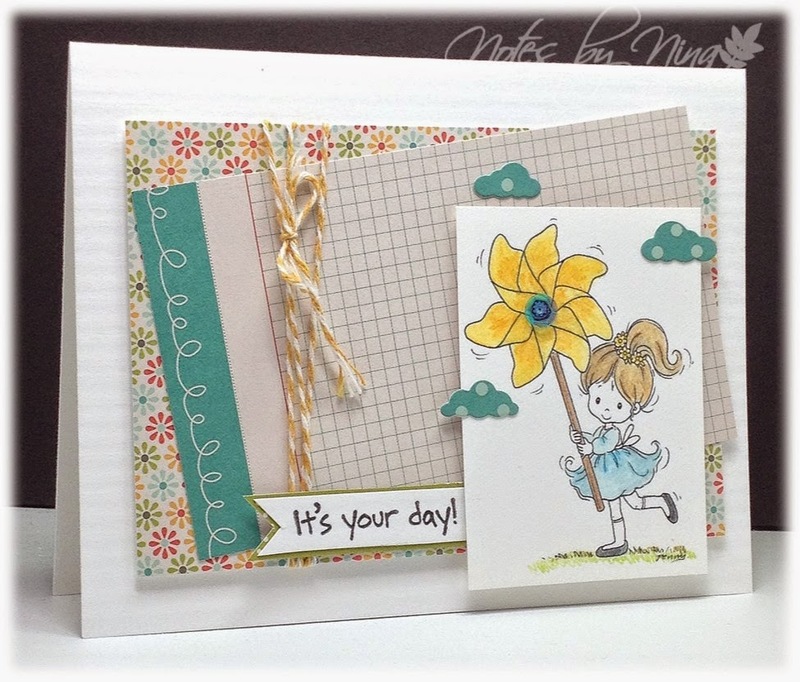 Stop by the Merry Monday Card Challenge blog to see all the wonderful inspiration that the design team has created. Good Morning and Merry Monday. 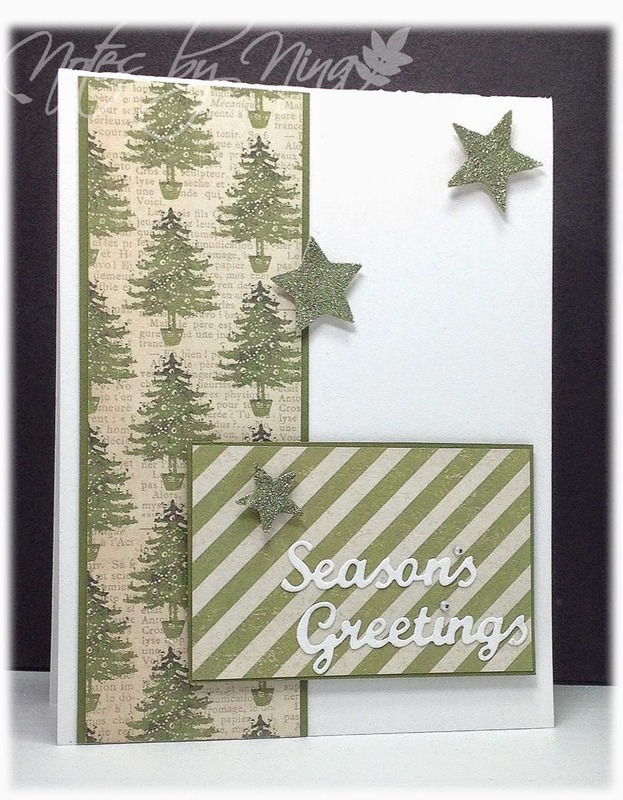 We have a new Merry Monday Christmas Card Challenge for you, this week LeAnne is asking us to Use shades of green and white, neutrals are welcome on your Christmas card. I love this DP, who can’t - it did all the work for me J. I added a die cut sentiment an finished with some die cut stars that are popped up with foam tape and covered in a pretty green glitter. I also added a couple of gems the sentiment just for the fun of it. Supplies: White and green card stock, Designer Paper – Carta Bella, misc die cuts, glitter, gems. 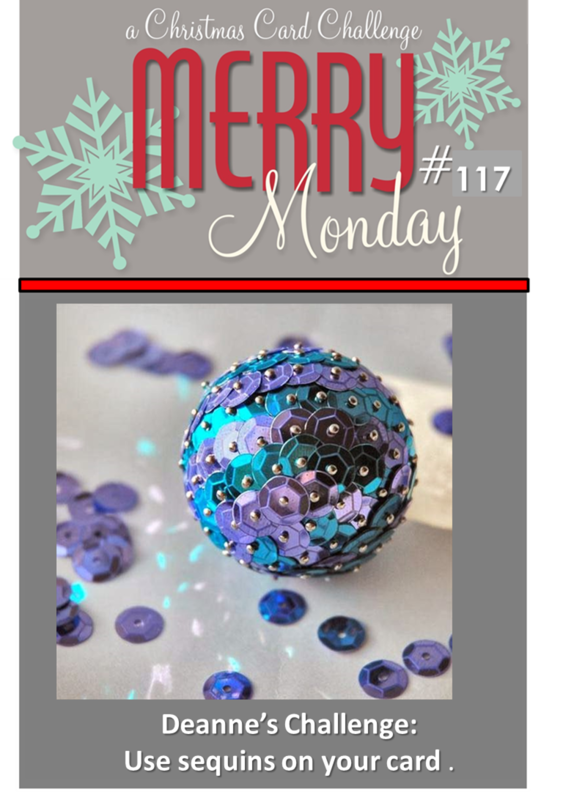 Stop by the Merry Monday blog and see all the great cards created by the design team, I love all that inspiration.